I've been working on decorating my kitchen shelves (surprise, surprise) and thought I would break down a few of the projects into a couple of different posts, so nothing gets lost in the mix. 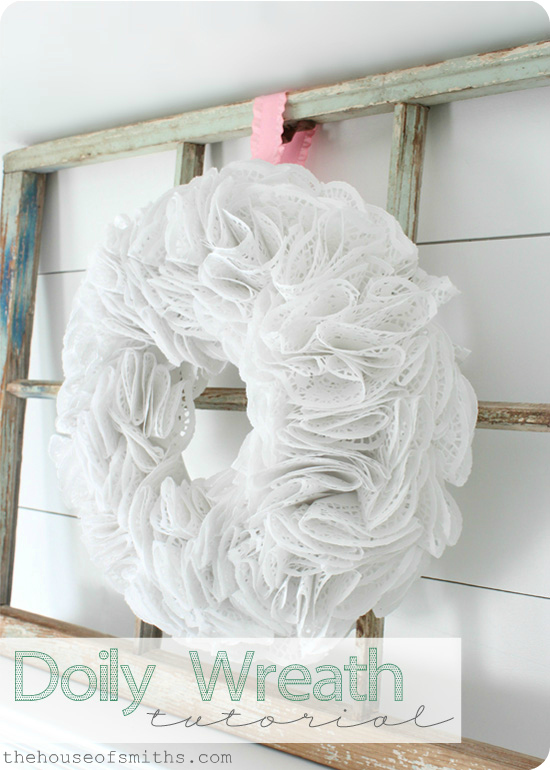 First up, is my DIY Doily Wreath Tutorial! 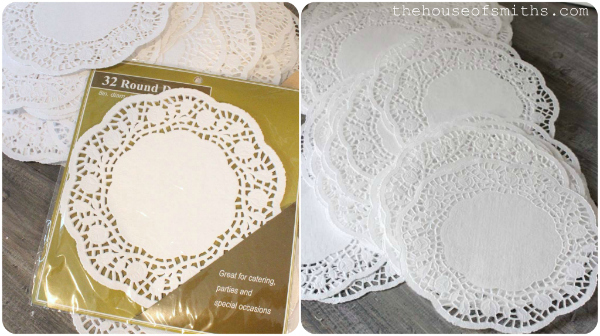 I asked people where I could purchase paper doilies for super cheap, the other day on our Facebook page, and I got LOTS of great responses (thanks!). Ultimately I ended up finding the ones I needed at a local dollar store near by. yahoo! So between the Styrofoam wreath form (that I got at Michaels craft store with a 40% off coupon) and the 4 packs of doilies; I ended up only spending about $8 for the entire project! This wreath is SUPER easy once you master "the fold". I used 8 inch doilies for my wreath, but you can pick whatever size you want. Really, all you have to do is take a doily, fold it in half like a taco, bring one end of the doily to the middle (where your thumb is) and the other end to the middle in the BACK where your fingers are; so it sort of creates a snake or S like shape. Then you simply add a dab of hot glue at the bottom points where the folds overlap, so the doily doesn't pop back open on ya... and that's it! 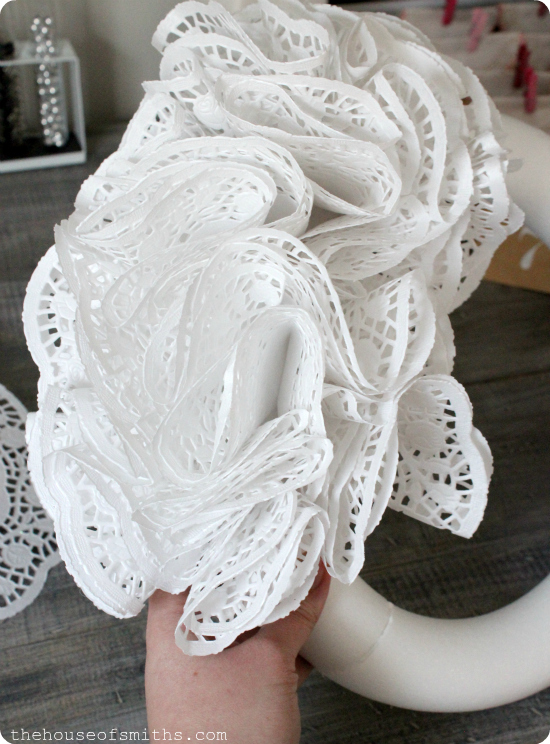 Honestly, ANY type of fold will do, as long as you only pinch and glue the doily towards the bottom, so the top maintains a billowy, curved shape. It doesn't have to be perfect because you'll be cramming all the doilies onto the form close together anyway. Personally, I like to make a bunch of doilies all at once, while I'm on a roll, because then the wreath assembly process moves faster. You can see this same folding technique with the fabric flower hair bows I made a few years back. At first I put my doilies on my form pretty loosely, but then realized I wanted my wreath to look a bit fuller, so I just went back in with more of the folded doilies and filled in random spots until I had the look I wanted. 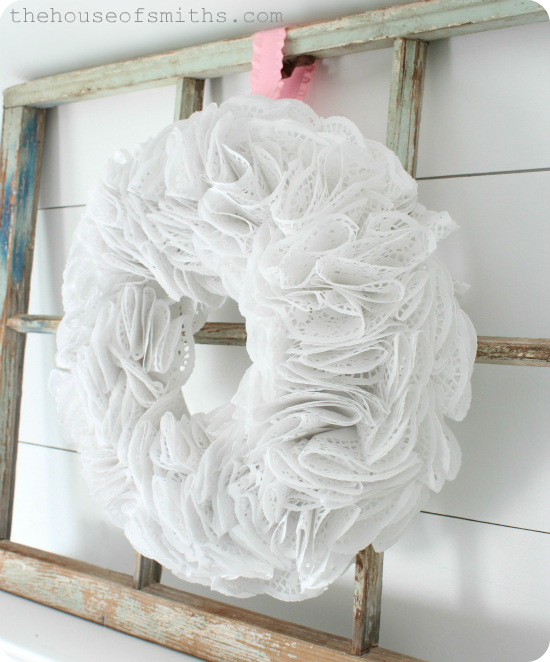 What I love about this wreath is that it's REALLY inexpensive, takes hardly any know-how and gives my display that fancy-frilly, lacy look that I was going for. If you want to change it up from just plain ol' white, you can add glitter to the ends, ink them with a colored stamp pad of your choice or even use different colored doilies! There are tons of different ways to customize this basic wreath tutorial for any birthday, holiday or occasion. Totally cute Shelly! Love it! Cute! Would be perfect for a little girl's party too! SO cute Shelley! 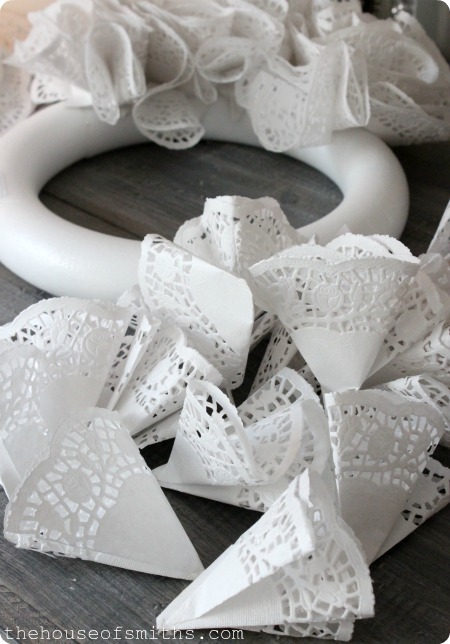 I don't know why, but I never thought to use those paper doilies to make a wreath! Great use for them! So cute! 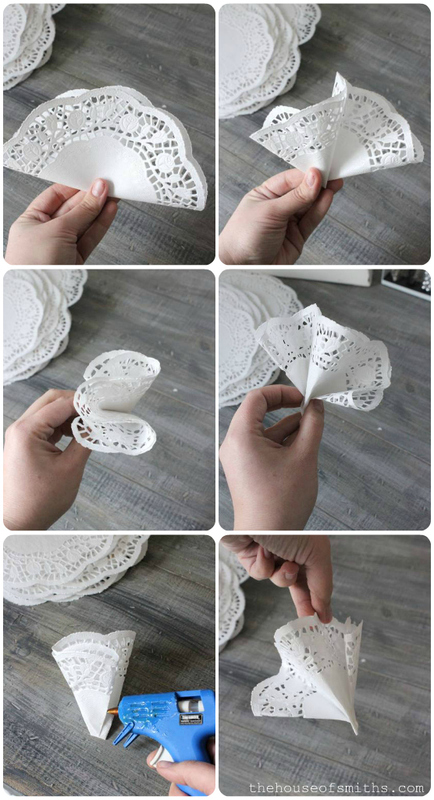 I've seen coffee filters and book pages, never thought of doilies. It's very beautiful!!! Oh thats such a fab idea! Love it, just wonder if anyone makes red doily's? I love this wreath!!! Especially the way it looks against the new white planked walls! In the great words of Justin Timberlake "You're bringin doilies back, Yeeah!" I LOVE this Shelley! Target dollar section has doilies...I may just have to make this myself. Thanks for the tutorial! That turned out really pretty. I like the bright white color and the frilliness. That is so cute! I think it not only makes a sweet Valentine's Day decoration, but it would be perfect for my niece's Burlap & Lace wedding theme! I've been looking for a pretty, yet inexpensive way to decorate the barn doors at the venue. just love this wreath, elegant! Pinned. great idea! I'm going to try it!!! ty. So so cute!!! I have been making lots of wreaths lately, I mixed coffee filters with doilies on my last one, but I love the ALL doilies look! It's super pretty, and of course I love the old window frame! Yum! Did you snag it at fleaology? I love it! What a great idea and its so "valentiney!" Super cute! Thanks for sharing. I just saw the Doily's at my Dollar Store last week. Going to grab them NOW :-)! Thanks, again! This is so sweet! I think it'd be great for summer too since it's the bright white. Thanks for sharing! This is such a cute idea. I have 2 BFF birthdays coming up and this could be the perfect gift. 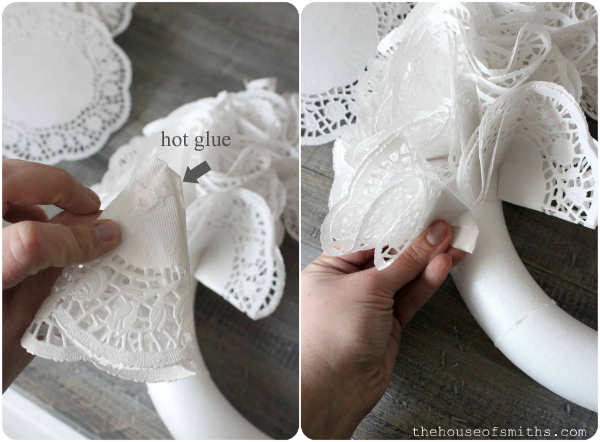 Did you attach the ribbon befre adding the doilies? this is great. i dont care for the really bold valentines decor, so this might just be the diy i've been looking for! This wreath is so elegant. I can't believe how fluffy it is from doilies. Great idea. Love it Shelley! Looks beautiful! Thanks so much everyone for the sweet comments!!! This is so pretty! I love it. What size wreath did you use? This is so pretty! I love it! What size wreath did you use? Just finished one in a heart shape. Love it! Thanks for sharing this sweet project! I saw the red heart shaped dollies at the Dollar store, but I searched for 15 minutes and I couldn't find the white round ones.. do you remember which section they were in. LOVE your blog--and your new kitchen! !